I am sitting down to write these words after dropping the older kids off at a playdate and then rushing home to vacuum out my minivan and hopefully get a few other things done. My van was at the point where there were more crumbs and birdseed from a craft project on the floor, than actual carpet. It was bad! 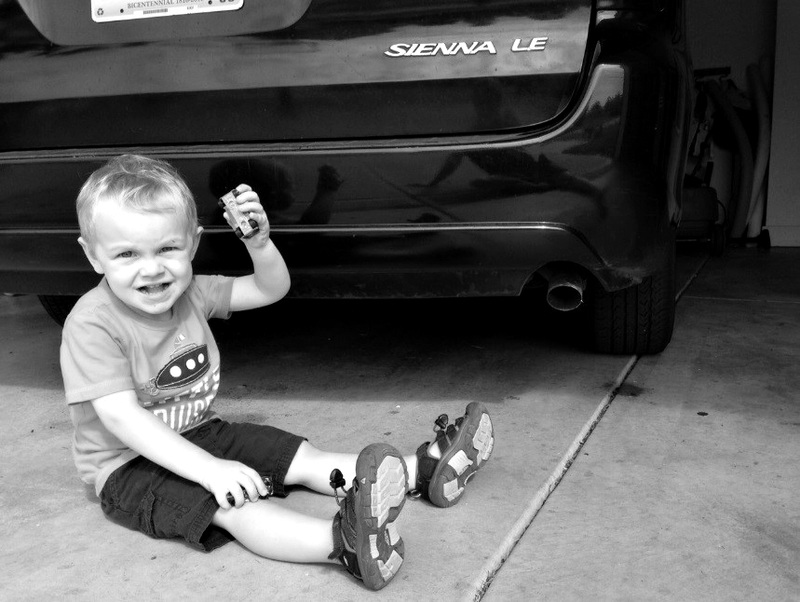 While I worked with the Shop-Vac, my two-year-old sat on the garage floor nearby happily playing with his toy cars. I was relieved that my son seemed to be so content to play, while I worked. He is an active little guy! This little boy of mine is the one who, if I am sitting on the floor, he will come catapulting across the carpet to land juxtaposed somewhere between my back and my shoulder blades. I am not just a mom. I am a human jungle gym too. Halfway through my vacuum job, I turned to look at my son and realized that all his toy cars were missing. I asked him where they went and he pointed to the exhaust pipe of my van. I looked deep in to the black depths of the pipe and could barely make out the rear bumper of one of his toy cars. Fishing toy cars out of my exhaust pipe, with a wire hanger, was not on my agenda for the day! But, alas, that’s the life of a mom. Right? It’s a good thing I love my kids because many days my well-thought out plans must go to the wayside so that I can do things that, in my pre-mom life, I would have never been creative enough to even imagine. After much reaching and twisting, I got six toy cars out of the pipe. Hopefully that was all of them! Time—or perhaps our mechanic—will soon tell. One friend suggested that I should just find a steep hill to drive up and then maybe any residual cars would fall out. Ha! This same week, we also lost our five-year-old daughter on the trail behind our house, when we decided to go for a family walk. We stopped to talk to a neighbor but she kept on going, on her bike. She had been riding ahead and stopping. This time she decided to not stop. When we realized she was nowhere in sight, we elicited the help of our neighbor, who was on her bike. We ran around on foot, up and down several trail entrances, while our neighbor rode ahead of us. After 10-minutes of heart-pounding searching, we finally found her a whole mile ahead of us, on the trial, resting at a picnic bench. I was wearing shoes that are not appropriate for running and my ankles were sore for days because I ran so fast and so hard, looking for her. Also this week, I had to apologize to my oldest child. I was angry at her younger sister for dilly-dallying when she was supposed to be getting dressed and I took it out on my oldest child because she happened to be standing there at the peak of my frustration. She readily forgave me. My eyes watered after I apologized because my ten-year-old daughter is so sweet and forgiving. She is not a little girl anymore but not a woman either. There in the middle-land of childhood, I spy glimpses of the young woman she is becoming and I love that young woman. 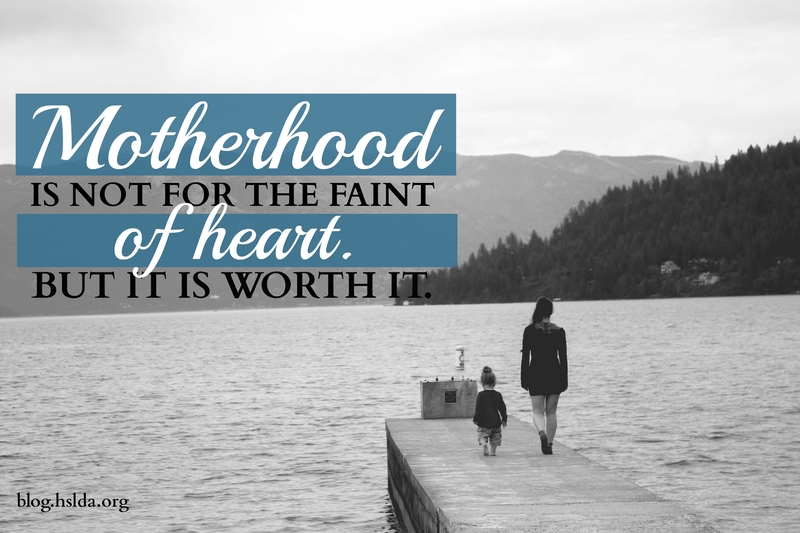 Motherhood is not for the faint of heart. It’s rough sometimes (or I should say, many times). My kids are not always obedient or respectful like they should be, just like I have my own sin struggles too. My kids make a lot of extra work for me. They send my heart racing sometimes. They expose my flaws better and quicker than anyone else could. I have discovered that anything in life that is worth anything is usually difficult to come by. Motherhood is no exception. This rugged road of motherhood has taken me to an imperfect place of deep joy. Every day I am weary but it’s all worth it. I have four little people who love me. Photo Credit: First photo graphic design by Charity Klicka; second photo by Amy Koons.